Liquid Swords este cel de-al 2-lea album al lui GZA și a fost lansat în data de 7 noiembrie 1995, prin Geffen & MCA. All tracks produced by RZA, except track 13 produced by 4th Disciple. "Liquid Swords" contains background vocals from RZA. "Living in the World Today" contains background vocals from RZA and Method Man. "Gold" contains background vocals from Method Man. "Cold World" contains additional vocals from Life. "Labels" contains background vocals from RZA and Masta Killa. "Hell's Wind Staff" contains additional vocals from RZA, Masta Killa & Dreddy Kruger. "I Gotcha Back" contains background vocals from RZA. 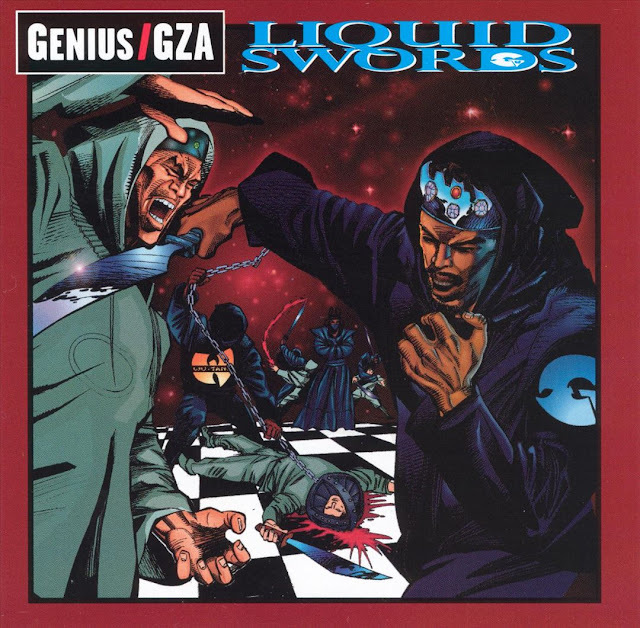 "Liquid Swords" contains samples from "Groovin'" and "Mercy, Mercy, Mercy" by Willie Mitchell, and “Legend of Lone Wolf” by W. Michael Lewis & Mark Lewis from the movie Shogun Assassin. "Duel of the Iron Mic" contains a sample from "I'm Afraid the Masquerade Is Over" by David Porter, and dialogue excerpts from the films Shogun Assassin and Dragon on Fire. "Living in the World Today" contains samples from "I'm His Wife, You're Just a Friend" by Ann Sexton and "In The Hole" by The Bar-Kays. "Gold" contains a sample from "The Aries" by Cannonball Adderley. "Cold World" contains samples from "In The Rain" by The Dramatics and "Plastic People" by The Mothers of Invention, interpolations from "Rocket Love" by Stevie Wonder and "Love Me In A Special Way" by DeBarge, and dialogue excerpts from the film Shogun Assassin. "Labels" contains a sample from "Don't Leave Me This Way" by Thelma Houston. "4th Chamber" contains a dialogue excerpt from the film Shogun Assassin, and samples from "Assassin With Son" by W. Michael Lewis & Mark Lewis from the movie Shogun Assassin, "Groovin'" by Willie Mitchell and "Dharmatma Theme Music (Sad)" by Kalyanji Anandji. "Shadowboxin'" contains a dialogue excerpt from the film Shaolin Vs Lama, and a sample from "Trouble, Heartaches & Sadness" by Ann Peebles. "Hell's Wind Staff" contains an interpolation of "Lost in Love" by New Edition and a sample from "Soul Vibrations" by Dorothy Ashby. "Investigative Reports" contains a sample from "I'd Be So Happy" by Three Dog Night. "I Gotcha Back" contains a dialogue excerpt from the film Shogun Assassin and samples from "As Long as I've Got You" by The Charmels and "Is It Him or Me" by Jackie Jackson. "B.I.B.L.E. (Basic Instructions Before Leaving Earth)" contains a sample from "Our Love Has Died" by the Ohio Players.